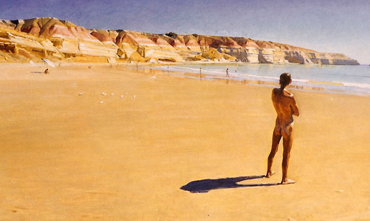 ART Images SA is an art exhibition featuring some of South Australia’s most eminent artists and sculptors. Artists include Robert Hannaford, Alison Mitchell, David Dridan, Ken Martin, David Hamilton, Sally Parnis, Heather McLaughlin, Susan Tingay, Geraldine Krieg, Nick Krieg, and Jane Hutchinson. Enjoy the photography of Anne Clarke and Jack Davies. Sculptors Silvio Apponyi from Elliston and Marijan Bekic whose work includes the Fisherman’s Memorial at the Marina and the Big Farmer at Wudinna will demonstrate their skills throughout SALT. These masters will be seen on the Port Lincoln foreshore, sculpting large [1.5tonnes] chunks of Wudinna granite throughout the 10 days of the festival so head down to see mastery in action. The exhibition will be held in the Rotary Gallery, and be opened by Peter Goers ABC Radio personality at 6.30 pm on Friday April 21st.